Assassinate Agnis to complete a Dark Brotherhood contract. After speaking to Nazir, you are told to locate and assassinate a target known as Agnis. She can be found inside the keep of Fort Greymoor which is west of Whiterun. The fort is initially garrisoned by bandits, whom you can either sneak past or kill. 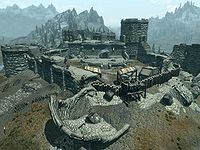 However if you have advanced far enough in the civil war quest line (beyond the Battle for Whiterun), it is garrisoned by soldiers of whichever faction controls Whiterun - your faction, that is, making the assassination much easier. Either way, Agnis is easily found inside the keep and, having only a dagger and some modest clothing for protection, is equally easy to kill. If you approach Agnis before you kill her, you will receive three dialogue options; you will only be able to choose one as you can not initiate conversation with her again. Note that none of these dialogue options will cause her to become hostile. After the kill, report back to Nazir for a leveled gold as a reward. When receiving payment for the finished job, Nazir will say "Infiltrating an occupied fort and making it out in one piece is nothing to joke about. Well done. ", but his voice dialogue actually says "Infiltrating an occupied military fort and making it out in one piece is nothing to joke about. Well done." 10 I must kill the old woman Agnis, who serves as a servant in Fort Greymoor. I may use any means at my disposal. When I am done, I am to report back to Nazir at the Sanctuary and collect my reward. 200 Finishes quest Agnis is dead, and I have collected my reward from Nazir at the Sanctuary. On the PC, it is possible to use the console to advance through the quest by entering setstage DBSideContract09 stage, where stage is the number of the stage you wish to complete. It is not possible to un-complete (i.e. go back) quest stages, but it is possible to clear all stages of the quest using resetquest DBSideContract09. This page was last modified on 15 April 2019, at 01:53.